The global optocouplers market has been covered under the scope of this report. The advancement in the automobiles and industrial applications has propelled the growth of companies which produce optocouplers. Optocouplers are capable of isolating different voltage levels thus safeguarding components from voltage spikes in the same circuit. These components are highly used in automobiles, industrial applications, communication sector and printer & imaging devices among others. The primary purpose of the optocouplers is to isolate or step down from high voltage current to low voltage current. New technologies for isolation are giving rise to high speed, high operating temperature and low input current optocouplers. Global optocouplers market is primarily driven by factors such as growth of industrial and automotive sector in emerging markets. Industrial automation communication and automotive sectors are witnessing high demand for optocouplers in developing countries such as China, India, and others. The market in these regions are mainly driven by huge investment for faster communication systems and demand for high end automotives The increase in automation in the manufacturing sector is driving the growth of the market as the optocouplers forms an integral part of the automation process. Optocouplers are required to isolate electrical current in various components and transfer data while isolating noise. Moreover, increasing demand for hybrid vehicles (HEVs) globally is driving the market for optocouplers. Considering all these positive impacts, demand for optocouplers is set to rise during the forecast period, i.e., 2015 to 2021. Based on types of optocouplers, the global market can be segmented into 4 pin optocouplers, 6 pin optocouplers, high speed optocouplers, IGBT gate drivers, isolation amplifiers, and others. Isolation amplifiers garnered the maximum revenue in 2014. Isolation amplifiers Isolation amplifiers are designed for sensing current and voltage in electronic power converters. Electronic power converters are used in renewable energy systems and motor drives, where current flows from an external resistor and the resulting analog drop is sensed by an isolation amplifier. Renewable energy sources such as solar inverters and wind turbine inverters are gaining significance due to the depletion of non-renewable energy sources. These factors have boosted the growth and demand for renewable energy across the globe. The global optocoupler market has also benefited from this growth. Thus, the global market share of isolation amplifier is estimated to increase marginally by 2021. Hence, growing demand for isolation amplifier is boosting the growth of this market globally. Optocouplers market, by applications is segmented as consumer electronics, printer and imaginf device, automotive, communication, commercial, industrial and others. Industrial sector was the largest contributor to the market in 2014 and accounted for a substantial share of the overall market. The increasing use of assembly line concept in manufacturing industrias is the major driving factor this segment. Further, growing demand for communication network, automotive usage and printer and imaging devices among others in fuelling the market growth of this application area. Optocouplers market has been classified geographically into North America, Europe, Asia Pacific and Rest of the World. North America acquired the largest share of the market in 2014 and was followed by Europe. 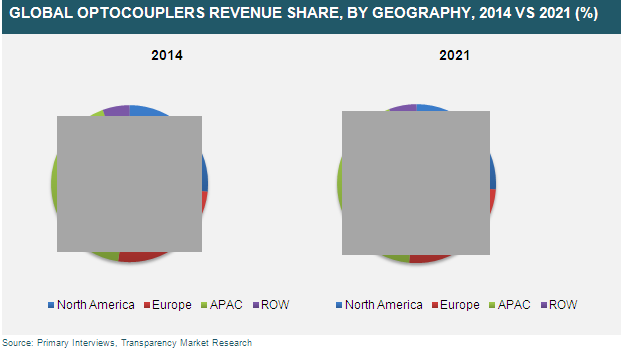 In terms of revenue, Europe acquired the largest share of the market in 2014 followed by Asia Pacific. Rise in the demand of optocouplers is witnessed in the industrial and the automotive sectors. The primary factors which are driving European market include increasing demand for automation in manufacturing companies, rising demand for HEVs and communication sector. Growth of optocouplers market in Asia-Pacific region can be attributed to the high demand in industrial application and automotive sector. The global optocouplers market, by product types is bifurcated into six segments such as 4 pin optocouplers, 6 pin optocouplers, high speed optocouplers, IGBT gate drivers, isolation amplifiers and others. Some of the leading players in the market are Avago Technologies (United States), Fairchild Semiconductor (United States), Vishay Intertechnology (United States), and Renesas Electronics (Japan) among others. Optocouplers or opto-isolators are electronic devices used to protect components that require low voltage inputs. Optocouplers isolate a lower voltage section from a high voltage section in the same circuit.. The scope of the report includes competitive analysis of various market segments based on types, applications and in-depth cross sectional scrutiny of the optocouplers market across different geographic segments. Growing demand for automotive and industrial optocouplers has fuelled the growth of optocouplers market. Optocouplers are used for isolation of components that requires low voltage to operate and also for transferring data while filtering noise among others. Increasing penetration of high end vehicles with driver assistance systems and various industrial applications for isolating components is driving the market for optocouplers,. Driver assistance system in automotives requires an electronic control unit (ECU) to operate which runs on a considerably low voltage. This step down of voltage and isolation is achieved through an optocouplers. Moreover industrial machines and components require a high voltage butwhere as some components among them require low voltage to operate. These needs for isolation of voltages are generally achieved through an optocoupler. As a result, usage of optocouplers is estimated to rise during the forecast period. To aid in strategic decision making, the report also includes competitive profiling of leading players in the industry and their market share in different geographic regions (North America, Europe, Asia Pacific and Rest of the World). Moreover, various business strategies adopted by leading players has also been discussed in the report. The market attractiveness analysis in the report provides insight into market dynamics and industry competition. The report segments the market on the basis of geography into North America, Europe, Asia Pacific, and Rest of the World (RoW), and estimated in terms revenue (USD Billion). In addition, the report segments the market based on product types into 4 pin optocouplers, 6 pin optocouplers, high speed optocouplers, IGBT gate driver optocouplers and isolation amplifier optocouplers. The market is also segmented by application of optocouplers in different sectors into automotive, printer and imaging device, signage, commercial, industrial and communication. Each application segment and product type has also been estimated on the basis of geography in terms of revenue (USD Billion). The report also provides breakdown and review of various factors impacting the market growth, which are appropriately described as market drivers, restraints, and opportunities. These factors determine various existing trends and their impact on market growth. Overall, the report includes a holistic analysis of the global optocouplers market, and provides an estimate of growth for the period 2015 to 2021, keeping in mind the various factors that has an impact on the market. Some of the leading players in the market are: Avago Technologies (United States), Fairchild Semiconductor (United States), Vishay Intertechnology (United States), Toshiba Corporation (Japan), Silicon Laboratories, Inc. (United States), Analog Devices, Inc. (United States) and Renesas Electronics (Japan) among others.